One of the most anticipated chess events in the chess calendar get underway today, Saturday, August 18 in the chess capital of the world. The 2018 Sinquefield Cup is an elite international event, featuring 10 of the strongest chess players in the world. 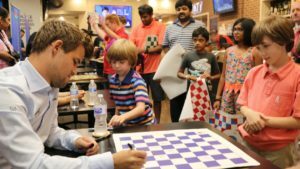 Over the course of nine rounds, these competitors will battle for $300,000 in prize money, points toward the Grand Chess Tour, and the coveted title of 2018 Sinquefield Cup Champion. To watch live, click here.